Some things simply ought to be big. A small Harley engine just won't do. Nor one you'd not hear from half a mile away. With speakers, it's only current fashion which belabours biggitude. It wants to hang small flat-panel speakers right next to that, ha, ginormous flat-panel tellie without taking up floor space. In the olden days, speakers were noisy furniture. Even two-ways had 10" to 12" woofers. Whilst those didn't descend as low as the best of today's high-excursion 7-inch wonders—those might hit -3dB @ 35Hz where the vintage breed barely got to 50—there's something to cubic inches for which the longest of throws sadly won't compensate. At least so sez the vintage ethos. Amen. 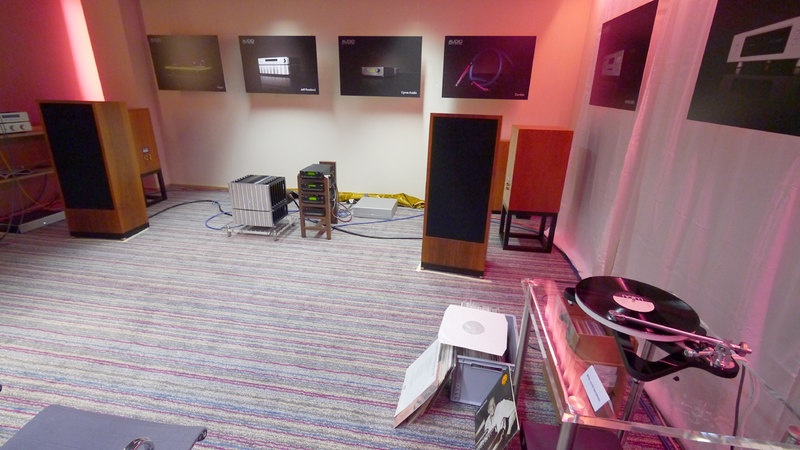 Trenner & Friedl Isis at HighEnd Suisse 2014 with Cyrus and Jeff Rowland electronics. 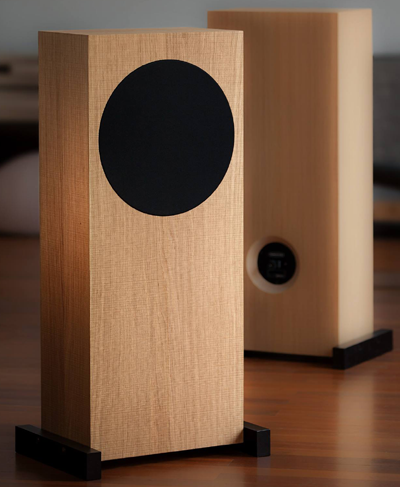 Today it's been revived by the likes of Zu who don't even have a midrange smaller than 10.3 inches; or Japan-bound legacy Tannoys which still pay homage to this idea; or two higher-efficiency models in the DeVore Fidelity catalogue; plus Audio Note and sundry. And as you figured from this intro, the Trenner & Friedl chaps from Austria aka Peter & Andreas. Now personally, I really don't like big speakers. They cover up our terrific lake and mountain views. They take up too much space inside. They obscure parts of the soundstage by standing smack in the way. Heck, refrigerators belong in the kitchen. And built in for chrissakes where you don't see 'em. 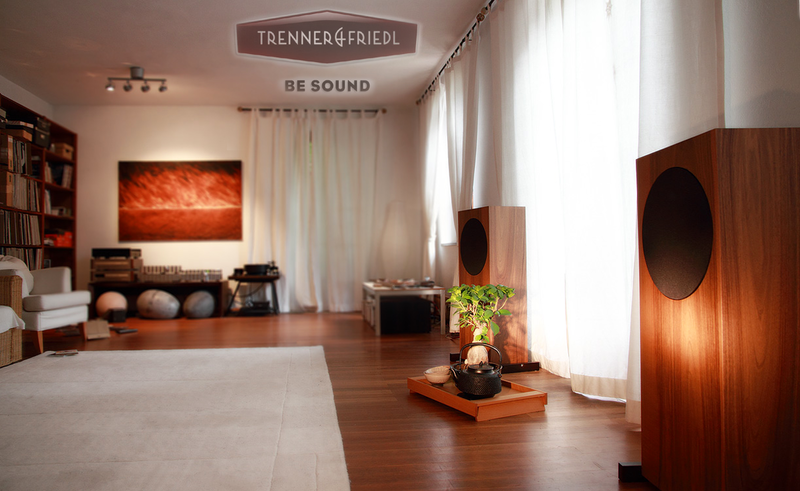 But - at two trade show demos, at HighEnd Suisse 2014 and then later the same year in two different exhibits at the November Warsaw show, Trenner & Friedl speakers had squatted in some of my favourite rooms. Me thinkest that a gentleman can only protest so much before an admission is due. Three strikes and you're on. Here said admission must be that despite personal preferences to the contrary, certain sonic results just might require a different approach. Mind you, I still wasn't prepared to host their commodious 3-way Isis in which you could hang 15 suits with their matching pants and have room to spare. After all, my audition room for work is also our comfy room for living. Hence their 8-inch Pharoah sampled in Warsaw with a Trilogy tube-hybrid integrated would become my more modest entrée into their world. Call it the vintage-is-hip-again realm of broad-shouldered hifi furniture which celebrates unapologetic rectangulosity. Here boat-hull curvatures and non-parallel walls are for geeky sissies. Think wannabe bikers with plastic-shrouded crotch rockets when real men ride big exposed iron. Delivery of my loaners to morph me into such a he man at least for the duration would be by the very same Swiss dealer who'd hosted that first room at the Zürich show whilst using Jeff Rowland electronics. Sissie dimensions of 950 x 400 x 240mm HxWxD really wouldn't be foreboding. It's the twice as broad as deep look which triggers those retro reflexes. This cabinet isn't yer standard MDF affair either but "golden ratio-proportioned Multiplex Birch wood of different densities damped with Austrian sheep's wool." There's	also a "high-precision machined-from-solid horn" for the tweeter whilst the paper-cone mid/woofer is "impregnated with a six-layer finish of Italian balsamic oil lacquer".